Bushnell rangefinders continue to push the technology envelope, and this year’s product lineup keeps the “pushing” in high gear. Start with its top-of-the-line Hybrid, which combines the latest in laser and GPS technologies to provide better data so golfers of all levels can make better decisions on the course. Hybrid takes the guesswork out of the game by displaying the lasered distances to the pin and GPS provided front and back yardage readings within the LCD. 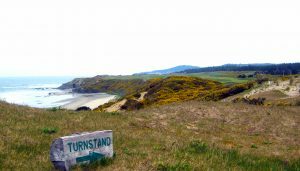 The device incorporates GPS front, center and back yardages to assist with correct club selections when golfers have cart path only or blind shots. A gadget like this take more juice, so Bushnell figured what it calls Dual Power Technology into the mix. The CR2 battery will power the laser and the USB rechargeable lithium ion battery will power the GPS. Then there’s PinSeeker with JOLT Technology — short, vibrating bursts to signify the device has isolated the target and locked onto the flag. Other features include 5x magnification to up to 400 yards, fast focus and stable grip. Next up is Phantom, perhaps the coolest little rangefinder of the year — tiny in stature but plenty big in distance data. The Phantom comes preloaded with more than 36,000 courses and provides simple measurements to the front, center and back distances of the green – along with up to four hazard/layup distances per hole. The device also has what the company calls “Bite Technology” — a high powered magnet the Phantom can easily attach to a cart bar or any metal surface, providing quick and easy yardage readings. Additional features include auto course and auto hole recognition, shot distance calculator and long battery life (play up to two rounds before charging). 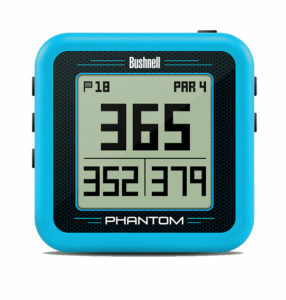 Bushnell Golf’s latest Golf GPS innovation also integrates Bluetooth technology; coupled with the Bushnell Golf Mobile application, the Phantom no longer needs to use a computer for course updates. It comes in four colors — Black, Red, Electric Blue, Neon Yellow. Finally there’s Bushnell’s newest GPS wearable, the iON2, which has been redesigned. 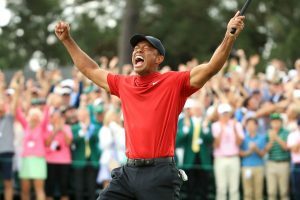 It too features Bluetooth technology and the Bushnell Golf app for automatic updates to the move than 36,000 preloaded courses in over 30 countries. The iON2 cooks up instant yardage measurements in a simple, fashion-forward design featuring a reversible band. The iON2 offers the golfer long battery life (three full rounds), and even more benefits such as a shot distance calculator, pedometer, odometer and the ability to get up to four hazard distances per hole. 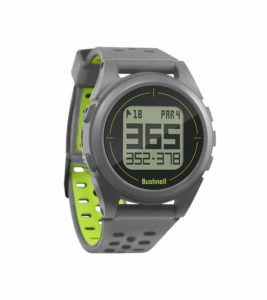 The iON2 Golf GPS Watch is capable of instantly recognizing courses. It features auto-hole advance which automatically changes from one hole to the next. 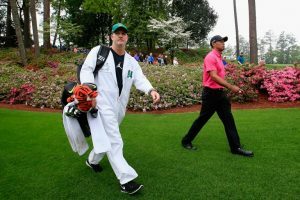 An integrated step counter has been added allowing the golfer to track distance, speed, and total activity time throughout their round of golf. 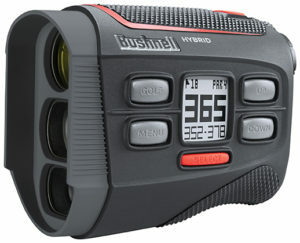 Check the price of the Bushnell Hybrid on Amazon! Check the price of the Bushnell Phantom on Amazon! Check the price of the iON2 on Amazon!